Insights for last week's study: scroll to the bottom of the page HERE. 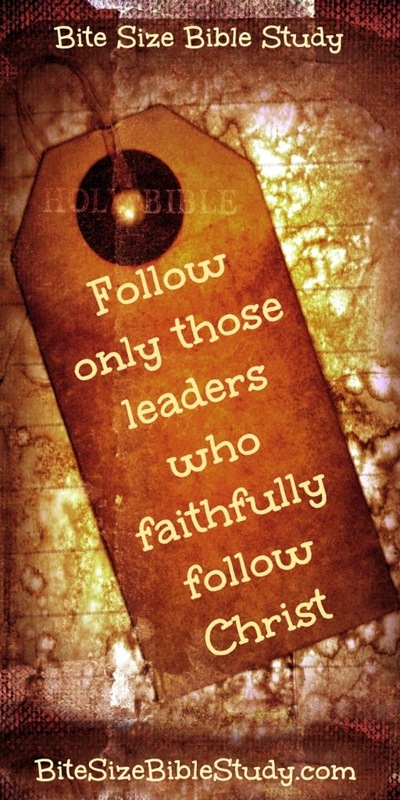 Leaders get more recognition, but nothing would get done without faithful followers. When we get to heaven, we'll see many "behind-the-scene" followers rewarded for their kingdom work. But following can also get us into trouble. Scripture says "Bad company corrupts good character" (1 Corinthians 15:33). That's why we need to evaluate the character of those we follow. And even when we follow godly leaders, we need to check their decisions with Scripture. The Bible is our most important resource for understanding what pleases Christ (Ephesians 5:8-17). * Scripture doesn't specifically say Miriam was the leader. God rebuked both her and Aaron, but he punished Miriam. This fact and the fact that Aaron had followed bad advice in the past leads me to believe he was following Miriam's lead in this situation. The two examples below give us more insight into godly and ungodly "following." 1.What kind of follower was Sarah in this passage? 2. What kind of a follower was David in this passage? 1. Sarah follows - submits - to Abraham's plan that she pretend she is his sister, and she comes very close to having an adulterous sexual relationship with Abimelek, King of Gerar. Obviously, Sarah was a beautiful woman, but Abraham's plan was foolish, dishonest, and faithless. He used a half-truth (i.e. half-lie) to protect himself instead of trusting God. It's interesting that the pagan Abimelek showed more faith than Abraham in this passage - God spoke to Abimelek and he listened. So, to answer our question "What kind of follower was Sarah in this passage?" This is also true of a soldier and his commanding officer, an employee and her boss, a pastor and his church members, a parent and her child...Scripture tells us to respect those in authority, but we are NEVER to violate God's commands in the process. God's authority is always supreme. 2. David finds his enemy Saul in a compromised position. Saul would have killed David if he'd found him in a similar situation, and Saul certainly deserved to be killed from a human standpoint considering the way he had violated God's commands and was intent on murdering David. In addition, David's men told him God had given him this opportunity and he should take it. But David had a faith-filled understanding of God's commands to respect those in authority. He knew God would deal with Saul in his own way and in his own time, so David refused to harm Saul and even felt remorse for taking a piece of his robe. So, to answer our question "What kind of follower was David in this passage?" David was a godly follower in this situation--he overcame peer pressure and personal offense to do the right thing.